A Life of Sugar and Spice: Merry Christmas!!! Isn't she just precious??? I am so in love with my little niece Maggie. 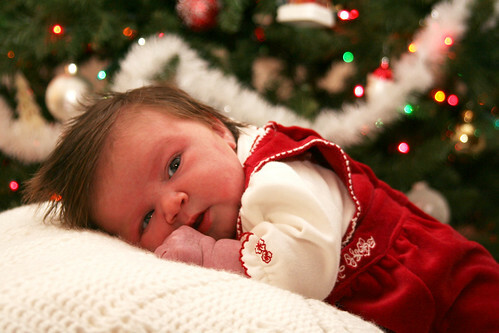 I can't wait to squeeze her tomorrow on her first Christmas! I have a bunch of food reviews to write and upload, sorry for the lack in posts here. Things are going well and I'm sticking with the gf/cf diet. My stomach is not perfect being off meds, but it's not horrible. I also just started montly B12 injections. I'm actually thinking that I will probably not argue when the doc asks me to go back on the meds. Being off of them for a few weeks and feeling the difference in my stomach, I realize that they really were working. We'll see what happens on January 5th I guess. I hope you are all doing well during this holiday season! Happy Holidays to you and yours!! Not even apples are safe. Sugar and Spice is a metaphor. Of course.